Go Vegan? Why on Earth Would You? If you’re the kind of person who always switches the light off when you leave the room, makes an effort to use the shower instead of the bath and can’t wait until you can afford an electric car then it might be time to take a look at what’s on your plate. It’s becoming increasingly apparent that world leaders are choosing to ignore the state of the environment but regardless of this, your choices can still create a big impact. NASA has predicted that global temperatures will continue to rise over the next century due to the effect that human activity has on the environment, and that this will produce a myriad of different problems. Sea levels will rise by up to 4 feet in some areas by 2100, hurricanes will become more frequent and more intense and droughts will occur more often and last for longer. So what’s that got to do with your chicken nuggets? Raising animals for human consumption is among the top causes of global climate change, loss of biodiversity, pollution and water shortage. Animal agriculture contributes to climate change in a number of ways but the main issues are outlined below. According to statistics, feeding a meat eater takes at least three times as much water as it takes to feed a vegan. Given the growing demand in animal products thanks to a rise in income and population, this means that currently 70% of the earth’s accessible freshwater is used for farming. When compared to the 10% that is used domestically that’s an incredibly large chunk. In fact, for all the water it takes to produce a single burger you could enjoy almost 2 months worth of showers. To measure protein sources against each other, 1lb of meat takes approximately 15 times the amount of water to produce in comparison to 1lb of soy. Not only does animal agriculture demand a huge portion of the planet’s fresh water supply but it’s also responsible for polluting water. It’s believed that the livestock sector is in fact the largest sectoral contributor to water pollution. Unfortunately with animals comes waste, and when animals are being forced to reproduce at such high rates in heavily concentrated areas manure and slurry ends up polluting lakes. In turn this can kill life in the lake and put the health of other animals, who may use the lake as a water source, in danger. 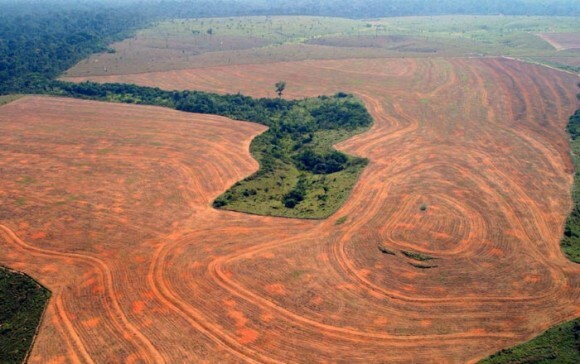 A whopping 4 billion hectares of the world’s land mass is currently dedicated to agriculture and of this land 70% of it is used to rear animals. With an increased demand for animal products and a rise in population this number is only set to grow. However, if everyone were to eat a plant based diet the land mass required to feed the world could reduce to 0.6 billion – 1.2 billion. Deforestation is also a huge issue when it comes to global warming. Not only does deforestation risk certain species of animal such as the orangutan but rainforests in particular are fundamental in offsetting carbon production. There are growing concerns over products such as palm oil and an increase in the popularity of coconut products because of the land mass required. However, currently 70% of the deforested land in the Amazon is used either as pastures or used to grow crops to feed animals. It might be surprising but animal agriculture produces nearly 40% more greenhouse gas emissions than the entire of the world’s transportation combined. In fact livestock and their byproducts are responsible for 51% of the planet’s greenhouse gas emissions. Not only are the emissions higher but the type of gases produced by animal agriculture have the potential to produce a much more devastating effect on the world than CO2, a gas we known we want to avoid producing. Cows produce 150 billion gallons of methane every single day and yet methane is between 25 and 100 times more destructive than CO2. Animal agriculture is also the main human contributor of nitrous oxide, a gas which stays in the atmosphere for 150 years and has the global warming potential of nearly 300 times that of CO2. All of these issues not only contribute to global warming but can also lead to a huge reduction in biodiversity. If we continue in this vein then we risk killing off species that we cannot live without: pollinators. Without bees and other pollinators we won’t be able to eat at all let alone consume animal products. We are already seeing a huge reduction in the numbers of bees as well as many other indicators that human activity is threatening life on planet earth. A change to a plant-based diet could have a huge impact on the world around us and requires no leaps in technology or huge financial investments. So save a life, save the earth, eat your greens and go vegan!